Well...I can't speak as a long time Benz owner, but I recently purchased a 1993 400E and I must say this car is awesome! It is in mint condition, all electronics work flawlessly, engine has the power of my '91 mustang convertible 5.0, but the ride is of course much smoother. I took it to a german Mercedes mechanic who has specialized in Mercedes for over 20 years and he told me this engine will be solid for at least 300,000 miles (currently has 113,000). I'm not sure if the quality remains on Benz's manufactured today...but it looks to me like the quality sure remains on 1993 400E. This car is 10 years old and still remains in brand new condition. I'm not impressed easily, but the quality of this car is very impressive!! I've had my 1998 BMW 528i for about 4 years, and it's beenpretty reliable up til the past 3 months or so...seems everything is falling apart at once. I just clocked 160,000 miles on it though, so I guess I can't really complain too much. I was looking to trade it in for the new 5 series, but after seeing what a mess of a car the design team at BMW has produced in the '04 5 series, I'm now looking at an S-Class, probabaly an '02. I have a question though....my pal recently told me the S was going to be "remodeled" in '05. Any truth to that? as a general rule: new cars are lame. I had a 1999 E320 and drove it to 52,000 miles and traded it when the new 2001 C-320 was released. The E320 was a very solid car. There was never an instance where I ever had a experience or thought that my glovebox would fall off (the car is built solid and can take hard use) as described in another post. When I had to trade in the car it still performed great mechanically, meaning I never had a single problem and the quality never seemed to vary from the day I purchased the car. Cosmetically the interior and overall car looked very nice. After owning it I believe that it's built very well and if the car is for a single driver or a family with kids regardless of the wear it would have on the seats etc. from kids the interior and car still holds up well and is long lasting. The engine and mechanics of the car were oustanding. There were no problems and I pushed the car to the limit since that was my car when I turned 16. When I got my 2001 C-320 I loved it initially. 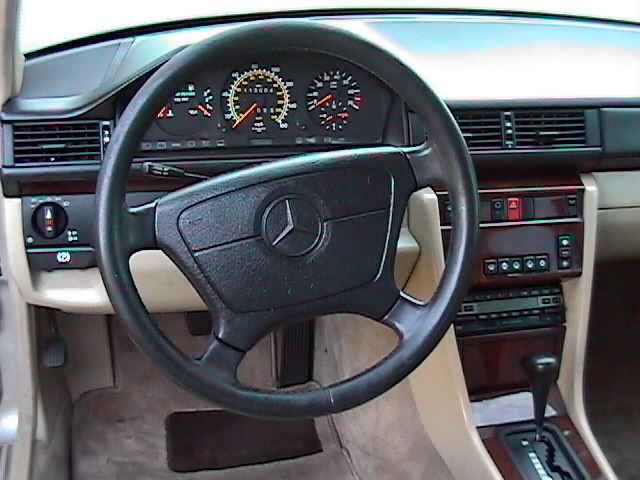 I had the newest mercedes technology with the leather and computer in the car etc. However, after about a year I realized that I just didn't hold up as well as my E-Class. The E-Class was perfect. I was only 18 when I got the C-Class and still drover it really hard. The transmission had started breaking itself down and there was metal in my oil pan according to my service rep at a Hoehn Mercedes in San Diego County. This was at around 36,000 miles. Mercedes put a new transmission module in my car and fixed everything and it felt like a new car and that's what you can expect from Mercedes, but I still knew that an issue like this and long-term I was better off with an E-Class and wouldn't see this with an E-Class. The E-Class makes Mercedes the majority of their revenue, so they put in the extra Research & Development and Testing so there are no problems. The C-Class is also basically an entry-level Mercedes so I guess the quality wouldn't be the same an E-Class. I traded in the C-Class and got a 2004 E500 two weeks ago. I paid an extra $1,950 and got an extended Mercedes warranty so i'm covered for 6 years 100k. That is the best thing to do if you are concerned about your car lasting and cost. Get the warranty from Mercedes, but you must get it the when you buy the car or within the first year, otherwise you won't be able to purchase a warranty that protects you like you are normally covered for the first 4 years 50k. I think with the E-class Models & Up, the quality only gets better as technology improves. I guarantee an E-class will last you a lot longer than a new 5-series. My friend has had a 1999 540i and has spent thousands repairing it as he got into higher mileage. Plus, mercedes tries to cover under warranty anything it possibly can, while bmw tries to do them opposite. That is the verdict from a friend who is a bmw owner. Hopefully you will go with the 04 E-Class. When my 99 E320 runs, it's an awesome car to drive. When it doesn't run it is a nightmare. Two transmissions at 49K miles, rack & pinion assembly replaced at 15K, rear door windows fall into the door sporadically, emissions, emissions, emissions problems like you wouldn't believe. And now the CD changer gets confused from time to time and can't remember whether the magazine is installed or not and the driver's seat control won't let the seat move back. I was hoping for a 300K+ mile experience like people I know who own older models, but now I'd be ecstatic to make it past 150.
probably not a huge help, but if the seat won't move back, it is probably just out of synchonization. move it all the way forward (obviously you can't be in the seat while doing this) and hold the button for five seconds after it has reached the end of its travel. you should be able to move it backwards now. repeat the same process moving backwards and it should function as normal. rwvw415, why both outside mirrors on the E430? And about high routine services prices, hasn't this car a FSS (that put services at about 10K miles frequency)? European cars (whether BMW or Benz or Volvo) are junk. European cars cost twice the money when you buy them and twice the headache later down the road with twice the repair costs. Not worth it. Go for Japanese Toyotas or Hondas. Want a luxury go for Lexus. BMW's / Benz, Volvos are just a piece of junk. This is my experince with used car sales, problem fixing and ownership.